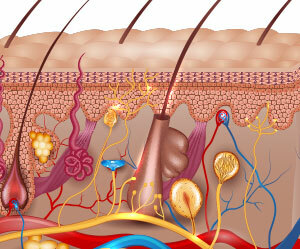 Skin plays an important role in our survival. It serves as a barrier to dehydration, UV light, and environmental toxins. It’s the largest or­gan, has one of the fastest regenerative rates, and is completely entrenched in a multitude of redox chemical reactions which must be orchestrated properly for our skin health to support our lives. Protection–RSM (REDOX signaling molecules)make it possible for the skin to protect against and attack pathogens. This is an inflamma­tory response that RSM also down-regulate to pre­vent tissue damage. Science today is leveraging this new knowledge to develop strategies to empower this first line of defense for our immune system. It is no wonder that there are lymph nodes strategically placed to assist the skin as it serves to defend and interact with the outside world. Oxidative Stress–Cells that are well nourished and rich in oxygen, generate energy (ATP in the mitochondria) and have a balanced array of REDOX signaling molecules. Disruption in availability is at the core of decline in cellular health and oxidative stress, and various skin illnesses. Wound Healing–Cuts and scrapes are healed by properly orches­trated RSM. When the damage is detected, RSM respond with messages to the immune system, triggering an inflammatory response and increasing circulation, creating collagen fibers to bind the wound, and creating scar tissue as it heals. Without RSM, none of these actions would be possible. Regeneration–Skin cells in healthy adults slough off and regen­erate about every 28 days. This happens properly only with abundant RSM. Detoxification–The skin serves as a detoxification route. Its incred­ible blood supply makes it a pathway for release of unwanted waste and foreign toxins. (This is why proper hydration can prevent buildup of waste on the skin as it seeks extraction). Sensation–The ability to feel a tiny hair touch your fingertip depends on redox molecules initiating a flux of electrons across a skin cell membrane leading to other redox synaptic nerve signals causing aware­ness of the stimuli. Skin is an important provider of sites for special functions and senses—all requiring redox reactions.